Earlier this year a group of experienced teachers, school governors, parents and local business leaders put forward a proposal to the Department for Education to establish a new secondary school in Cobham under the government's Free Schools initiative. This followed a range of extremely positive public meetings in which the plan for the new school was outlined and feedback was sought, and a huge wave of local support with more than 300 families expressing very strong interest in the school and many more members of the local community offering their support for the project. The DfE recognised the many strengths of the group's application and felt we had 'articulated a clear vision for a new secondary school'. However, they wanted us to expand our proposals in certain areas: therefore they encouraged us to continue to develop our plans and resubmit them in the next round of Free School applications with a view to taking our first cohort of Year 7 pupils in 2014 rather than 2013. This was obviously deeply disappointing for those pupils and parents of last year's Year 5 who expressed such strong support for the project, but we have been able to use the intervening period to revise and refine our application document, as well as continuing to talk with schools, businesses and other local organisations who may wish to be involved. Our core vision continues to be the development of a compact, innovative, state-of-the-art community secondary school, open and welcoming to all, independent of local authority control, and with the freedom to develop a bespoke education best suited to the needs of Cobham's children. It will combine the very best practice from both the state and private sectors, and will focus on high academic achievement, artistic and sporting excellence, and the development of self-confidence and strong leadership in all its pupils. The need for a new school is clear. We know that the number of secondary age children in Elmbridge will continue to increase year on year and that the hard-pressed local authority's response is to increase the capacity of the existing secondary schools. Unfortunately that does not solve the problem of Cobham being at the extremity of the catchment areas of these existing schools. Furthermore it is clearly the case that a Year 7 year group of 240-300 pupils is not the most appropriate learning environment for every 11 year-old. We now need to reconfirm to the DfE the community demand for such a school. Could we therefore urge all parents of primary age children to visit the Cobham High website – www.cobhamhigh.co.uk – and complete the simple online form to register your interest in and support of the proposed school. Our website also contains further information about the project as well as an opportunity to offer specific or more general support. 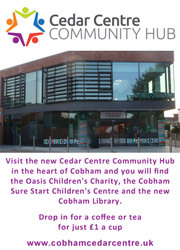 We believe the time has come for Cobham to secure for itself an outstanding maintained secondary school. Together we can make this happen and massively benefit current and future generations of our community's children. Thank you for your continuing support. *Please contact us via the email/phone below if you require further information, and could we ask you to let other families know who might be interested. Thank you.